The National Information Platform for Nutrition (NIPN) will host a Nutrition Policy and Research Seminar organized by the Ethiopian Public Health Institute (EPHI) and IFPRI at the EPHI training center on September 7. The seminar, which is on “Food systems and diets in Ethiopia” will feature presentations from Bart Minten, program leader of IFPRI’s Ethiopia Strategy Support Program, and Mestawet Gebru, research assistant in the Food Systems for Healthier Diets research flagship at Bioversity International. Food systems have rapidly evolved in Ethiopia, leading to significant changes. Diets are shifting away from starchy staples toward high-value products, such as animal-sourced foods, fruits and vegetables, and processed convenience foods. However, the prices of nutritious foods have been increasing. Agricultural production is also transforming through intensification and modernization. Agricultural supply chains are also expanding and are an increasing source of employment. The event will take a close look at the evolution of Ethiopia’s food system and the implications on farming and development. The seminar will also serve as occasion to discuss a research agenda to advance food systems for healthier diets in Ethiopia. 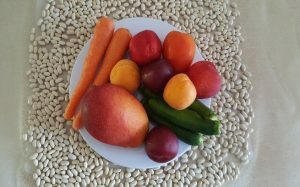 While dietary energy supply has improved, diets in Ethiopia remain low in diversity and provide insufficient amounts of protein, vitamin A, and zinc. Poor dietary quality contributes to the multiple burden of malnutrition in the country, with 38% stunting among children under five years and 24% anemia and 8% overweight among adult women. Under a food systems framework, key research questions have been identified with input from stakeholders and review of literature. This seminar will be the first of series of meetings organized together with EPHI and IFPRI under NIPN to disseminate research findings with the aim to promote nutrition knowledge among decision makers and promote interactions between decision makers and researchers. The National Information Platform for Nutrition (NIPN) is part of a global initiative launched by the European Commission to support countries with a large burden of undernutrition. It promotes the creation of country-owned, multi-sectoral information platforms for nutrition which will guide evidence-based decision making for nutrition policies and programming. The initiative is currently implemented in 10 countries that are members of the Scaling Up Nutrition (SUN) Movement. Funding is provided by the European Commission, the United Kingdom Department for International Development and the Bill & Melinda Gates Foundation. The EU support to the Ethiopian NIPN is rooted around two complementary actions. EPHI was selected as the lead national institution entrusted with the implementation of the NIPN. At the same time, due to its longstanding expertise in supporting capacity development and institutional changes, IFPRI has been assigned to support EPHI in establishing the platform under the umbrella of the Compact2025 initiative.